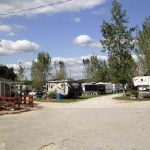 Ask fellow campers about "Lamplight Lane RV Resort at Glen Oaks (formerly Glen Oaks RV Park)" and nearby attractions. This park is a mix of seasonal and overnight campers. It is a tired, older park that the new owners have been working to fix up. The park is very close to the exit, but obviously results in road noise from the interstate. The campground roads are a dirt/gravel combination that tend to get muddy when it rains. We would stay here again, as the park is convenient and the owner was very nice. We camped at Lamplight Lane RV Resort at Glen Oaks (formerly Glen Oaks RV Park) in a Travel Trailer. Owners were extremely friendly and accommodating. A small park, located close to I-44 but traffic noise was not an issue. Another yearly stop for us from now on. We camped at Lamplight Lane RV Resort at Glen Oaks (formerly Glen Oaks RV Park) in a Motorhome. Tight park. The sites were somewhat uneven. The new owners are planning on some more improvements to the bathrooms and spacing of sites. We camped at Lamplight Lane RV Resort at Glen Oaks (formerly Glen Oaks RV Park) in a Fifth Wheel. The couple who own the park have been there only 8 months. They are working hard to get it fixed up. There are lots of things to do. Hopefully the bathrooms have been fixed up in June. The couple is very nice and the park is well located. We didn't flood when a lot of the area did. Some road noise. Will be a great park in a year. We camped at Lamplight Lane RV Resort at Glen Oaks (formerly Glen Oaks RV Park) in a Fifth Wheel. The area is full of historical and military places. Very tight, speed bumps that were not needed because of the large potholes. Very close to the interstate with a lot of road noise. Pulled out of our pull-through into a dead end and backed up so we could exit through our pull-through so we could avoid the low hanging branches on the exit road. The only high point to this place was the friendly owners. We camped at Lamplight Lane RV Resort at Glen Oaks (formerly Glen Oaks RV Park) in a Fifth Wheel. Just 250 yards from I-44; covered road noise with A/C fan. Several residents but neat overall. Gravel street and pull-through, so some mud after rain today. Grass needed mowing, not much shade available. Hookups functional, but barely. Decrepit picnic table at site. Showers, toilets, and laundry rooms all very old and in need of work. Pleasant communal patios with grill. Okay for overnight. Friendly owners. We camped at Lamplight Lane RV Resort at Glen Oaks (formerly Glen Oaks RV Park) in a Motorhome. We stayed here for our son's graduation from Basic Training at FLW. Owner very helpful with local info and reservation. Park was quiet and well kept, power and water good. Pull-through site was very level. No pool. No frills, a great value. Will stay here again. We camped at Lamplight Lane RV Resort at Glen Oaks (formerly Glen Oaks RV Park) in a Motorhome. This campground was the only one open in the area and we had a good stay here. The site we had was pretty level. There are people who are here long term. We found the owner very friendly and many of the people staying there. The park may need a little maintenance for some. We were happy here and it was quiet. Since people were here long term you could hear them coming and going at all times but, all in all it was not too bad for a place next to the highway. We camped at Lamplight Lane RV Resort at Glen Oaks (formerly Glen Oaks RV Park) in a Motorhome. Pretty basic place, but wifi and satellite friendly. The owner was nice. It is a small park with many being in the army. it is the closest to Fort Leonardwood (12 min.) North gate. I stayed a week to visit army son. Will stay again. Weekly rate $120 We camped at Lamplight Lane RV Resort at Glen Oaks (formerly Glen Oaks RV Park) in a Motorhome. I'm a soldier, and I stayed 6 months in this park. VERY low long-term rates of $175 per month. Cheapest I've found anywhere! I saw the grounds maintenance crew often, and they seemed quite friendly. The site I chose was well shaded, and the grounds are located in a park-like setting. If I am ever sent back to Fort Leonard would, I would definitely stay in this park again. The fact that the park had only 13 sites makes it noise-free and quite comfortable. We camped at Lamplight Lane RV Resort at Glen Oaks (formerly Glen Oaks RV Park) in a Travel Trailer. Rate reflects Good Sam discount. FHU pull-through site with 30 amp service. Free Wi-Fi, but it was very slow. Basic campground right off of I-44. Good place to stay for a night. We would stay here again for an easy overnight stop. We camped at Lamplight Lane RV Resort at Glen Oaks (formerly Glen Oaks RV Park) in a Fifth Wheel. We found the park to be neat and clean, as well as well maintained. Yes, it has gravel driveways, but they were level and free of potholes. We did not hear any noise from the nearby interstate. The staff was very kind and helpful. Probably not the place I'd plan to stay for a vacation, but definitely was a nice place to pull in and spend a night or two. We will definitely remember this place when traveling through in the future. We camped at Lamplight Lane RV Resort at Glen Oaks (formerly Glen Oaks RV Park) in a Travel Trailer. Although this is a Good Sam park it is in a poor, rundown condition. Minimal maintenance appears to be performed. Numerous potholes throughout the gravel interior roads and sites. Entrance is paved but has major potholes that could cause significant damage to vehicles and RVs. Park appears to have a number of permanent trailers. Very close to Interstate highway 44 and very noisy. Numerous barking dogs. Electric is 30 amp, but breakers are old and trip easily. We camped at Lamplight Lane RV Resort at Glen Oaks (formerly Glen Oaks RV Park) in a Motorhome. Poorly lighted bathroom. No TP or paper towels in holder. Sewer connector damaged and exposed. Generally poorly maintained. We camped at Lamplight Lane RV Resort at Glen Oaks (formerly Glen Oaks RV Park) in a Motorhome. Are you affiliated with Lamplight Lane RV Resort at Glen Oaks (formerly Glen Oaks RV Park) ?